"Follow us to get all the news and updates. Get in touch with us and be the first to know our special deals." MEMBERS of the public looking for attractive airfares and other attractions to go on a holiday can visit the 12th Belait Travel Fair hosted by Royal Brunei Airlines (RB) at the Pusat Insani, Seria from March 4 to 5. Twenty five stalls will be occupied by RB, travel agents – Anthony Tours, Century Travel, Darussalam Holdings, Freme Travel Services, Pan Bright Travel Services, Southern Cross and At-Taqwa Travel Tours, local banks Baiduri Bank, Bank Islam Brunei Darussalam (BIBD) and Standard Chartered Bank as well as Jerudong Park Country Club Sdn Bhd. Addressing a press conference, RB Marketing Manager Alirahim bin Haji Rani said the travel fair will serve as an appreciation to loyal customers and will provide a platform for local travel agents to promote their products and services from RB. He said beside travel agents and banks, Jerudong Park Country Club Sdn Bhd was participating in the two-day event for the first time to promote its products and services. He said in addition to promoting travel destinations, travel agents will also promote Brunei inbound products to support Brunei’s tourism initiatives. RB Head of Asia Sales Aji Puteh said the promotions will cover a period of travelling up to November 23, 2017. “In the two-day period, we will showcase promotional fares for long and short haul destinations for both economy and business class,” he said. RB’s Country Manager, (Brunei) Evelyn Ang said numerous destinations are on offer from RB through the participating travel agents. “The fares are extremely attractive and destinations on offer are London, Dubai, Melbourne, Singapore, Kuala Lumpur, Bangkok, Jakarta, Surabaya, Manila, Hong Kong, Shanghai, Ho Chi Minh City and Bali. For the first time Kota Kinabalu is also included in the travel fair following numerous feedback from the public,” she said. Meanwhile, Senior Manager of Sabre Travel Network, Abdul Halim bin Abdul Rahman is supporting the travel fair by providing over 35 terminals for travel agents. Sabre Travel Network will also contribute two lucky draw prizes for the event and also showcase consumer end product. Meanwhile, Baiduri Bank Head of Retail Banking and Branch Network, Pengiran Azaleen bin Pengiran Dato Haji Mustapha, said this is the 12th year Baiduri Bank is participating in the event. “We want to add value to our clients and travel agents as well as RB by giving rewards like preferred seat, extra baggage allowance and Royal Skies Miles to all successfully purchased fares by Baiduri cardholders,” he said. BIBD Manager of Promotion Campaign Development and Event, Ahmad Fidaus bin Pehin Dato Haji Salim said BIBD was giving away 33,000 Royal Skies Miles to five customers in conjunction with the national day and the first 20 customers who successfully apply for BIBD Credit Card during the fair will get 20,000 Royal Skies Miles. Freme Travel Services sources said during the Belait Travel Fair, it will offer attractive prices for group departure and tours to Europe and exclusive holiday deals for Royal Caribbean Cruise and also Dream Cruise. Freme Travel Services will offer early bird booking for new destinations and special prices for the March school holiday to Korea with RB. A daily draw with 25,000 Royal Skies Miles and instant lucky dips are also on offer. Darussalam Holdings Sdn Bhd (DHSB) will kick start its latest DHSB 2017 lucky draw where the first prize include two Umrah packages or two packages for six days and five nights to any European destination. The second prize is two packages to any destination within Australia while the third prize is any destination in Asean member countries for two packages. Among the main lucky draw prizes are RB’s grand draw where customers who purchased RB fares at the Belait Travel Fair are automatically entitled to win two return tickets to Dubai and two return tickets to Melbourne. The daily lucky draw will see four return economy tickets to Shanghai, Bali, Jakarta and Bangkok as well as four 10,000 Royal Skies Miles and merchandise. The Butterfly Cube Game will be open to customers who purchase tickets with the minimum spending of $500 at the fair. Prizes include discount vouchers for the next purchase with RB and merchandise. A social media quiz will be uploaded on RB social media channels where participants will hunt for the answer at the Belait Travel Fair. AT-TAQWA Travel Tours Sdn Bhd recently sent off 58 Umrah pilgrimsunder the 3rd At-Taqwa Umrah Group 2017 package. 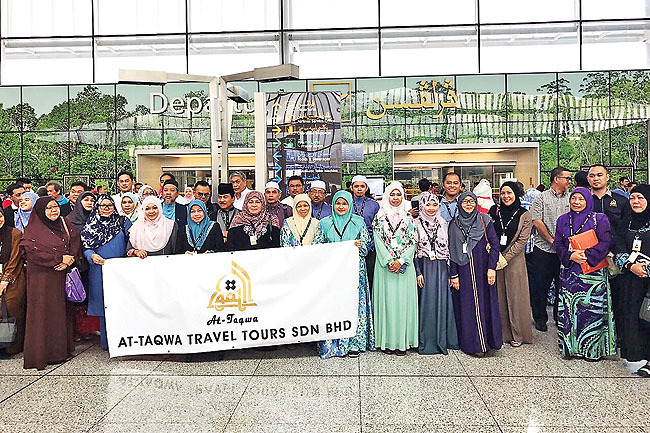 The group was led by two At-Taqwa officers, including Awangku Mohd Naasiruddeen bin Pengiran Haji Yusoff, the General Manager of At-Taqwa Travel Tours Sdn Bhd. AT-TAQWA Travel Tours will participate in the Brunei Travel Fair at Pusat Insani in Seria on March 4 and 5. This will be its third participation at the fair, which will offer customers several deals and packages. 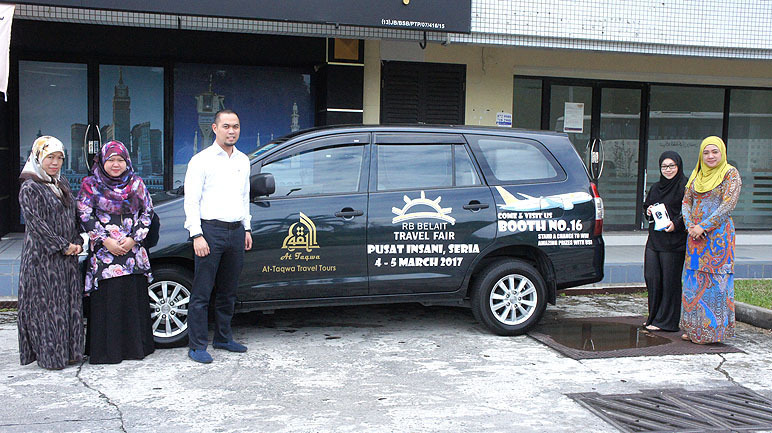 Speaking to the Weekend Bulletin, At-Taqwa Travel Tours General Manager Awangku Mohd Naasiruddeen bin Pengiran Haji Yussof explained that the fair will highlight a range of products, including Umrah and Haj packages. The company has begun registering individuals keen on taking on its Haj packages. At-Taqwa is also offering Umrah Plus packages (for December) where customers can choose tour packages along with Umrah to several destinations such as Dubai, Oman and Cairo. At-Taqwa is also offering inbound tour packages including the Temburong Tour package and Brunei River Cruise. Customers who make purchases at At-Taqwa’s booth during the fair will receive a $5 voucher per ticket bought, and will be entered into a draw, where the first prize is an Umrah package for one, second prize an air ticket to a mystery destination, and the third is a Fitbit Blaze Smart Fitness watch.